Today I found out what makes a boomerang come back. Non-returning boomerangs have been used for at least 20,000-30,000 years, with the oldest known example carved from a mammoth’s tusk. These non-returning boomerangs were used for hunting and were carved for straight flight and to stay in the air as long as possible when thrown correctly. The hunter was then able to throw the primitive boomerang great distances and hit an animal to be eaten for dinner. These animals were often small-game, but even the likes of kangaroo or emus can be sufficiently injured by a decently weighted boomerang such that the animal can no longer outrun the hunters. Possibly while shaping a non-returning boomerang, someone accidentally carved a boomerang into a shape that, when thrown correctly, came careening back toward the owner. It wasn’t exactly useful for hunting or warfare; it was difficult to aim; and if it actually hit its target, it wouldn’t come back anyway. There is some conjecture that returning boomerangs could have been used for flushing certain game, but there is little in the way of actual evidence to back these claims. 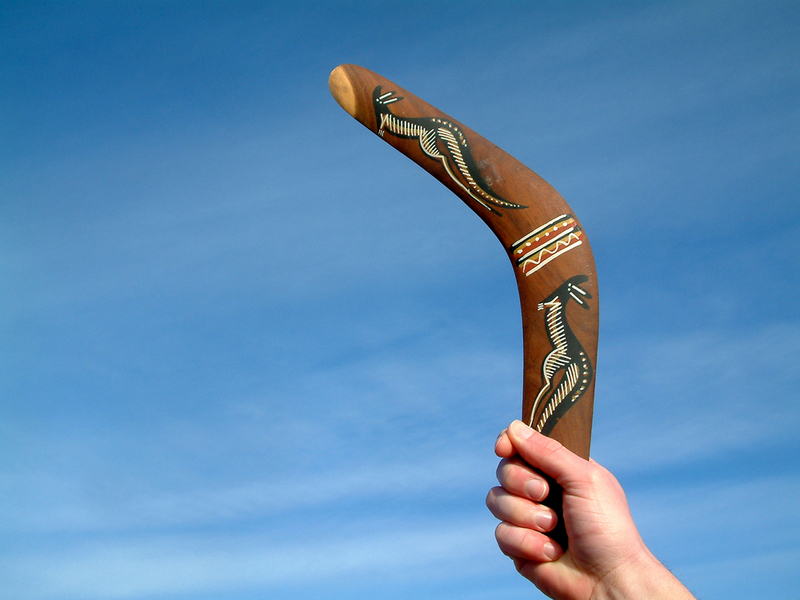 As such, most scholars believe that, because returning boomerangs don’t serve much of a functional purpose in hunting, they were simply used for sport, possibly first by the Australian aborigines, though Ancient Egyptians and many other cultures also made them. Tutankhamen actually had a collection of returning (and non-returning) boomerangs. While there are numerous different ways to make a boomerang, traditionally, returning boomerangs are lightweight, made of wood, and consist of two separate wings which meet at an angle in the middle. That middle section forms the central point around which the wings will be able to spin, stabilizing the flight pattern. So what makes a returning boomerang come back? Boomerang wings are fashioned much like airplane wings. They are flat on the bottom and precisely rounded on the top, which deflects the air such that there is less air pressure above than below. Given we explicitly pointed out this was a myth, you’ve probably spotted a flaw right off the bat, in the idea that two given air molecules need to rejoin at the same time at the other end of the wing after being separated. In truth, the design of the wing manipulates the air such that the air molecules above get, essentially, stretched into a bigger volume, thus lowering the pressure above, while the air molecules below have the opposite happen, being slightly compressed, increasing the pressure below. It is this difference in pressure between the two that causes the observed difference in air speed, not the other way around, nor some bizarre supposed physics property that requires air molecules forced apart to rejoin at the other end of the wing with the exact air molecules they previously were near. And, in fact, the air molecules rushing over the top will arrive at the back much faster than the air molecules they were previously near that go under the wing; they will not arrive at the same time. It should also be noted that further lift is created via the downwash that occurs at the rear of the wing thanks to the design and various pressure differences all coming together at that point. Back to boomerangs, as anyone who’s ever tried to throw a boomerang knows, it’s not all about the shape. You also have to throw the boomerang correctly in order to get it to come back to you—that is, you need to throw it somewhat vertically, holding it by one wing, with the other wing pointed up (think opposite to how you would throw a Frisbee), with the centre pointing toward you. Here’s why. As the boomerang spins through the air, the wing at the top of the spin is moving through the air at a faster rate than the wing at the bottom, because it is moving in the direction of the throw while the wing at the bottom is going the other way. The result is that the top portion will generate more lift than the bottom portion as it cuts through the air. You might think from this extra lift on the top vs. the bottom that a new rotation will be introduced around the center point and that it would still fly in a mostly straight line. Instead, thanks to its significant angular momentum, this is not the case. The difference in lift between the top and the bottom then creates a torque which ends up tilting the plane of rotation slightly such that the boomerang ends up flying in a curved path through the air. This is more technically known as a torque-induced precession or gyroscopic precession. The boomerang is generally considered to be the first manmade flying machine. 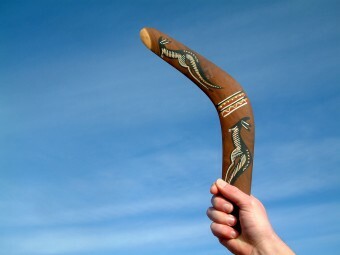 A boomerang is best thrown when it’s being held at approximately a 20 degree angle. Throw it like a baseball by bringing it behind you and snapping your wrist on release, which will give the boomerang the spin it needs to come back to you.